University faculty and advisors agree: One of the most important ways for a student boost an application to graduate school for a STEM field is to conduct and present research. “Long gone are the days when students could graduate from a university and not do research. If you have any intentions of going on to do any sort of advanced graduate work, and if you have any intentions of finding funding for your research for your graduate studies, you must do research,” said Assistant Vice Provost for Access and Success E. George Simms. 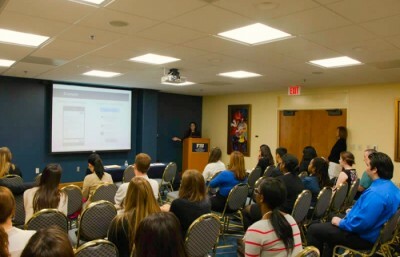 Hosted by the Ronald E. McNair Post-Baccalaureate Achievement Program at FIU, the FIU McNair Scholars Research Conference provides an opportunity for undergraduate students to present their research to peers, faculty and experts in their field. The conference will take place Oct. 14-16 and is open to all FIU students, as well as students from universities around the world. Last year’s participants included students from Marquette University, Binghamton University, the University of the West Indies and more. Simms said the goal of the McNair program and conference is to prepare students for top-notch universities and to apply for research funding once they’re in graduate school. “In the highly competitive world that is now applying for graduate schools, having something like great research—and especially mentored research, where you have a well-known person in that field writing a letter of recommendation, working with that student on producing a really publishable project—really helps students stand out from the horde,” said Steven Fernandez, director of the McNair Program. The McNair Conference is designed to guide undergraduate students through the research process and showcase their findings to the professional community. At the conference, students will have the chance to present their research in both oral and poster formats, participate in a graduate school fair and hear from guest speakers who are leaders in their fields of study. During the research process, students must work with faculty mentors who oversee their work and guide them through the process of gathering information and producing a paper ready for publishing. “When you start at the undergraduate level, it gives you a really big step forward because you already know what you are going to use in your application if you go to graduate school,” said Department of Earth and Environment professor Florentin Maurrasse, who serves as a mentored with the McNair Program. Maurrasse’s first mentee in the McNair Program was alumnus Jose Ilaguno ’14, who presented his research on sedimentology in Spain at last year’s McNair Conference. His research compared the current period of global warming to previous periods of global warming using the method of carbon sequestration, which compares carbon isotopes in layers of the ocean floor to determine climate conditions millions of years ago. Because of his experience researching with Maurrasse and presenting at the McNair Conference, Ilaguno decided to continue at FIU to earn his master’s in geosciences. This article was originally posted on July 27, 2015 on FIU News . Click here to read the original article.